Eye-catching off-road attributes and assured performance on rough ground combined with the premium characteristics and signature dynamics of a BMW - this was the blueprint with which BMW launched the all-new Sports Activity Vehicle (SAV) category almost 20 years ago. The first example of the breed was the X5, making it the founding father of the X-model family and the market leader in the premium all-wheel drive segment – a status it maintains to this day. More than 2.2 million examples of the BMW X5 have been sold across its three model generations. And the new car puts down another marker in terms of design and technology. The new X5 will again be built at the BMW Plant Spartanburg in the US state of South Carolina. This centre of expertise for BMW X models also handles production of the X3, X4, X6 – and will soon add the X7 to its roster as well. The worldwide market launch of the new BMW X5 begins in November 2018. The South African market sees two models available at launch. The X5 xDrive30d which has a six-cylinder in-line diesel engine mated to an 8-speed Steptronic transmission. Power figures from the 3.0-litre unit delivers 195kW/620Nm. It goes from 0 to 100km/h in 6.5 seconds with a claimed top speed of 230km/h. BMW SA says the combined fuel consumption is claimed at 6.8 – 6.0 litres/100km, with CO2 emissions combined at 179 – 158g/km. 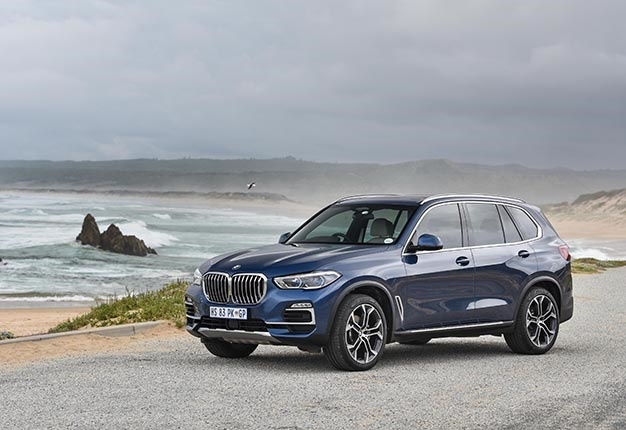 The second model is the BMW X5 M50d which has a six-cylinder in-line diesel engine, 8-speed Steptronic transmission with outputs of 294kW and 760Nm. It goes to 100km/h in 5.2 seconds, and has a claimed top speed of 250km/h. Fuel consumption combined is rated at 7.2 – 6.8 litres/100km, while CO2 emissions combined is rated at 190 – 179g/km. 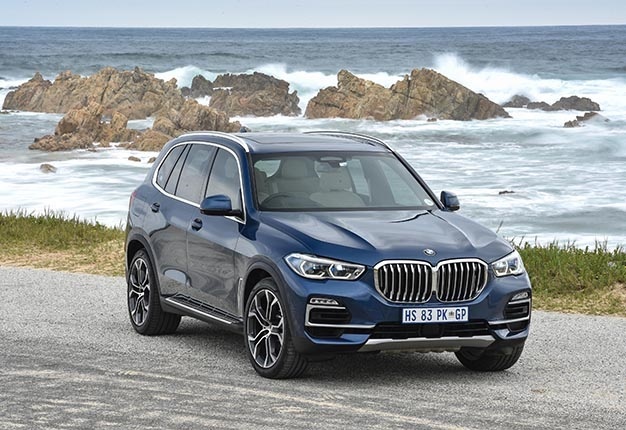 The new wheelbase is 42mm longer than its predecessor’s (now 2975mm), a 36mm increase in vehicle length (to 4922mm), an extra 66mm of width (now 2004mm) and a 19mm increase in height (to 1745mm) give the new BMW X5 both an imposing appearance and generous levels of space for passengers and their luggage. A powerfully sculpted bonnet, a short front overhang, lightly hexagonal wheel arches and the dynamic sweep of the roofline add to the sporty yet rugged character of the new X5. 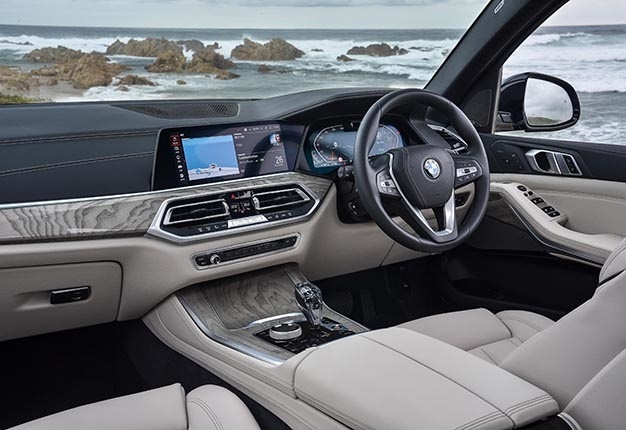 "The BMW X5 embodies the origins of the BMW X family and, in its fourth generation, sends out its most powerful message yet in terms of presence and modernity," says Adrian van Hooydonk, Senior Vice-President BMW Group Design. "It defines a new X design language – robust, clear and precise." The most striking feature of the front end is the large BMW kidney grille with single-piece surround. It comes standard with LED headlights, while BMW Laserlight with Adaptive LED Headlights can be specified as an option. This system employs a BMW Laserlight spotlight with Selective Beam to optimise the high beam function, and as a result the range of the non-dazzling high beam has been increased to around 500m. Blue x-shaped elements, which split up the hexagonal light sources inside the familiar BMW twin headlights, make a distinctive visual statement. The precise character line in the car's flanks, which rises up at the rear door, contributes to the modern appearance of the new X5. It defines the car’s powerful shoulders and feeds into the rear lights, which extend well into the flanks. All the lights feature LED technology in the rear too. The three-dimensional design of their glass covers lends them a sculpted, technical edge. Diagonal accent lines give the rear a compact and brawny appearance. xLine and M Sport model variants, options from BMW Individual. Distinctive design features mark out the xLine and M Sport model variants of the new X5. 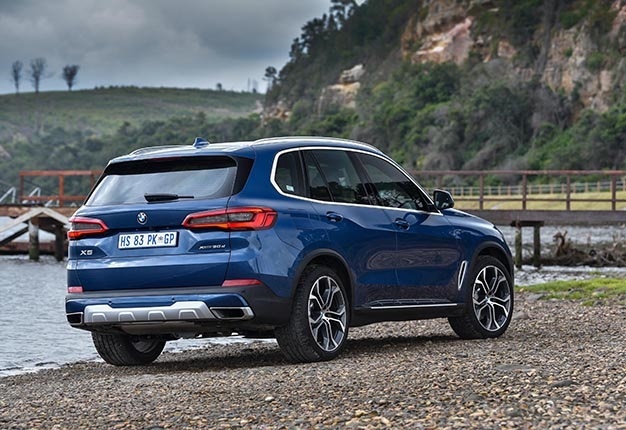 The xLine model uses exterior cues including kidney grill bars in aluminium matt, an underguard, roof rails and side window surrounds in Aluminium satinated, plus other accents in Pearl-effect Chrome, to accentuate the off-road character of the new BMW X5. M Sport specification, meanwhile, sees the wheel arch trim, bumper trim, rear underguard and side skirts painted in body colour. Added to which, the extra-large air intakes at the front end, the aluminium matt kidney grille bars, and the roof rails, side window surrounds and other trim elements in high-gloss black flag up the dynamic potential of the SAV. 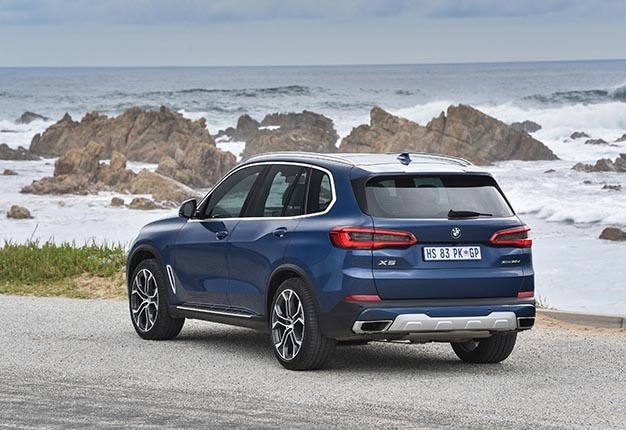 The new BMW X5 comes as standard with 18" light-alloy wheels, the xLine model features its own 19" light-alloy wheels and M Sport brings 20" M light-alloy wheels in twin-spoke design. Further variants in 18 to 22" formats are available as options. The new BMW X5 will also be available from launch with model-specific options from BMW Individual. Indeed, customers looking to bring extra exclusivity to the exterior design of their car can specify the BMW Individual paint finish Sunstone metallic, extended BMW Individual high-gloss Shadow Line, tinted headlights and rear lights, painted BMW Individual brake callipers and 21-inch BMW Individual light-alloy wheels. The instrument panel is broken up by sweeping horizontal lines, which combine with classy electroplated trim elements to emphasize the width of the interior. And with its large trim finisher and surrounds likewise made up of electroplated elements, the centre console – rising up to the instrument panel – also contributes to the handsome overall impression. The raised seating position, driver-focused cockpit and new design and arrangement of the controls offer the person at the wheel the best possible view of proceedings and enable him or her to maintain supreme control over the task of driving. The fully-digital instrument cluster and the Control Display are connected visually by consistency of design and also share the same graphics. The centre console hosts the Controller, the newly designed transmission selector lever and all other driving-related controls – i.e. the Driving Experience Control switch, the start/stop button and the buttons to activate the air suspension settings and off-road modes (if specified). A similarly new-look control panel for the heating and air conditioning is also on hand, and the light functions in the new X5 are likewise operated using buttons. The carefully selected materials in the interior include the new Vernasca variant for the standard leather upholstery. Like the optional BMW Individual extended Merino leather trim, it is available in five colours. It is fitted as standard with electrically adjustable and heated sports seats. Customers can also specify optional multifunction seats with massage function and seat ventilation for the driver and front passenger. The xLine and M Sport models also come with specific design features that bring a distinctive flair to the interior. The interior appointments for the xLine model accentuate the car’s robust versatility and luxurious ambience, while the M Sport model enhances the dynamic driving experience on board. The two equipment lines stand apart from basic specification with contrast stitching for the seat surfaces and illuminated door sill plates specific to each variant. M Sport trim also includes an M sports steering wheel, BMW Individual headliner in Anthracite, M-specific pedals, driver’s footrest and piping on the seats, plus exclusive interior trim strips in Aluminium Tetragon. Optimum power distribution The task of maximising traction, agility and directional stability in the new BMW X5 falls to the latest generation of the BMW xDrive intelligent all-wheel-drive system, which is now able to split drive torque between the front and rear wheels with even greater precision and speed, as the situation demands. For added efficiency, full power can be directed to the rear wheels only in situations where all-wheel drive is surplus to requirements. The new xDrive system also offers a rear-biased set-up for those occasions when the driver adopts a particularly dynamic style at the wheel. The electronically controlled rear differential lock (available in conjunction with the M Sport equipment line and the Off-Road package) gives the handling an even sportier edge. By limiting equalisation of the rotational speeds of the inside and outside wheels through corners, it is able to optimise the transfer of power to the road in dynamic driving situations. As a result, the new BMW X5 can power out of bends with exceptional élan. Governed by the Driving Stability Control (DSC) system, the locking function for the rear differential improves traction and power transmission when driving over loose ground or on road surfaces offering differing levels of grip for the left-rear and right-rear wheels. It does so by preventing a wheel from spinning when it is struggling for purchase. The locking effect is produced by means of an electric motor and allows as much as 1 500Nm of drive torque to be redirected from the faster-turning wheel to the slower-turning wheel. The design principle underpinning the chassis – based on a double-wishbone front axle and a five-link rear axle – also ticks all the right boxes for supreme traction on rough terrain, coupled with excellent dynamic responses and ride comfort in road driving. The SAV now comes as standard with the Dynamic Damper Control system, whose electronically controlled dampers sharpen the car’s handling dynamics at the same time as increasing ride and suspension comfort. The driver can select from two performance maps – for a more comfort-oriented or sportier driving style – using the Driving Experience Control switch. Standard specification for the new BMW X5 M50d includes model-specific kinematics and elastokinematics for the wheel suspension, individual spring and damper tuning, plus 21" M light-alloy wheels with mixed-size tyres. This bespoke configuration increases the BMW M Performance model’s agility and steering precision, enables faster cornering and optimises its transitional responses.